Tinking is not much fun. But sometimes you need to undo that knitting and then you only have two choices: pull out the needles and start ripping, or undo one stitch at a time. Tinking is the one stitch-at-a-time way. Did you know that Tink is knit spelled backwards? I didn’t. A student of mine had to point that out to me. And I should have known that not only because its pretty obvious (duh), but tinking is undoing knitting by working your needles in reverse. Knit on with confidence (as Elizabeth Zimmermann said) and when you have to tink, do that with confidence too. If you have a lot of stitches to tink out you may need to find some quiet, bad-cat-free time. Go find a cup of coffee too. Don’t try to rush it. Tinking seems to require more concentration than knitting for some reason. Like this video? I have more knitting tutorials and you might like those too. There are also tutorials for crochet and handspinning. And if you have a topic you want to see covered that I haven’t done, let me know. I take requests. 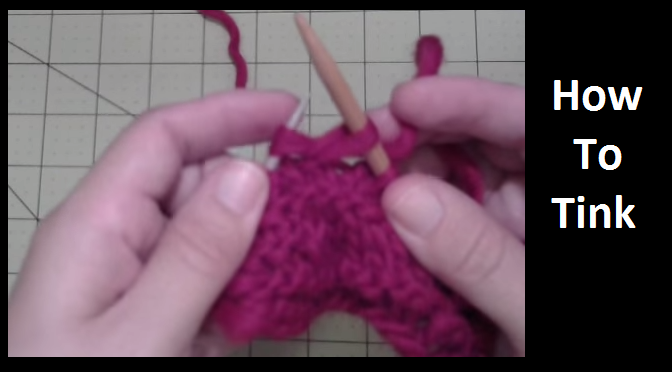 10 Comments on "Sunday Stitch – How to Tink"
I love your videos! You do such an excellent job of teaching! The camera work is really good. This will be something I come back to again and again. SSK especially helpful. That ssk trips knitters up. Glad you found it helpful and THANK-YOU for the encouragement on the videos. LOL. They are getting better but very slowly. Really well explained. Thanks so much. I’ve had to tink quite a bit at times, and worked out most of it by luck and error, but you explain it really well. Now … how do you do a “sl1 k1 psso” ? Well, now I know why my ssk and purl tinks are always twisted! Not that it has been a huge deal, I usually just go through the back loop the second go-around or reverse it when I get back to them. Thanks Jenn! Notice that here is no tutorial on this site for putting a whole row of stitches back on a needle. That’s because when I do it, those stitches are always twisted. 🙂 And I don’t much care! Like you you, I just fix it as I knit the next row. Tinking and ripping… the important part is to get the stitch on the needle before it drops and runs. Right? right. Right! Because that will be the time that the FOL (feline over-lord) is on you or wants to play with the yarn and there is no crochet hook in sight! Exactly. Nothing bring the bad-kitties out to play and mess with me like have a dropped stitch.